Alcohol-impaired driving accounts for almost one third of all motor vehicle deaths in the United States. Alcohol-impaired driving is an important issue for communities to address in order to reduce premature deaths for both perpetrator and victim. 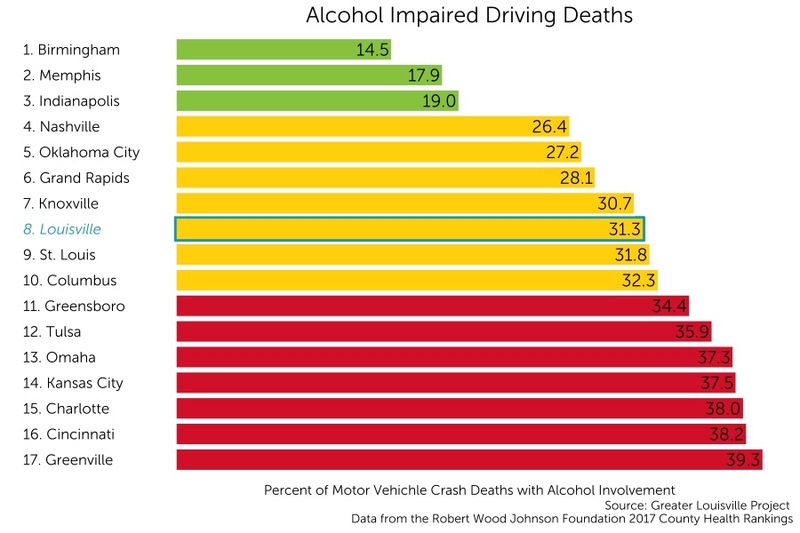 Louisville currently ranks 8th among its peer cities in percentage of Alcohol-Impaired driving deaths with 31.3% of driving deaths due to alcohol-impairment. Louisville ranks among the middle tier of its peer group according to a natural breaks algorithm. Cities in green are those that outperform their peers, cities in yellow represent the middle cluster, and those in red are a group that lags behind its peers on this indicator.